Preheat the oven to 250°. Line a large baking sheet with wax paper. Spread 1 tablespoon of the peanut butter on each of 8 slices of brioche and cover with the remaining 8 slices, making sandwiches. In a pie plate, beat the eggs with the cream and vanilla. In another pie plate, spread the crushed cornflakes. Lightly soak the sandwiches in the egg mixture, then dredge in the cornflakes, pressing to help them adhere. Transfer the sandwiches to the baking sheet. Melt 1 tablespoon of the butter in a very large skillet. Add 4 of the sandwiches and cook over moderate heat until golden and crisp on the bottom, 2 to 3 minutes. Transfer the half-cooked sandwiches to the baking sheet. Add another tablespoon of the butter to the skillet, flip the sandwiches back into the skillet and cook until golden and crisp on the bottom, about 2 minutes longer. Transfer to the baking sheet and keep warm in the oven. Wipe out the skillet and cook the remaining sandwiches. 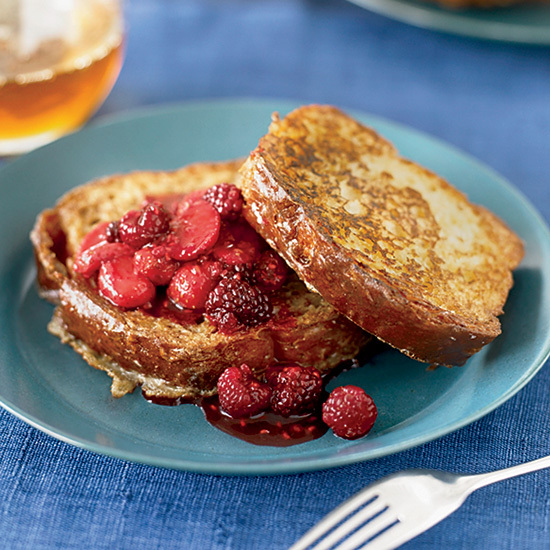 Transfer the French toast to plates and dust with confectioners' sugar. Top with the berries and drizzle with maple syrup.